Case: Two FBI Agents have been murdered by a man with a third eye. "We all have a third eye." The story in this episode, though it aims to do some interesting things around charismatic religious leaders, isn't that memorable, and The X-Files has treated similar subjects more effectively in the past. It does, however, provide an interesting insight into the state of play concerning the main characters and their relationships at this point in the series. In this episode, for whatever reason (the Internet is divided on whether it is due to actor availability, or a deliberate writing decision) Scully makes minimal appearances, while Doggett is joined by the A.D. himself, Skinner, to investigate his latest case. I've always been very fond of Skinner so I'm pretty much fine with this development. It's an interesting choice, though, as it suggests a certain hesitancy on the part of the creative team concerning whether Doggett can carry the show without the familiar presence of Scully. Skinner has been prominently featured in various episodes before, but usually when he is either closely tied in to the story, or the situation is particularly serious and high level (involving terrorism or a hostage situation, for example). 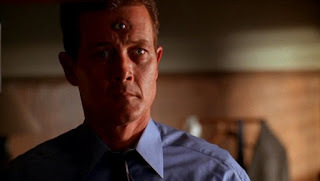 To see him simply working a normal X-Files case is rather strange — quite fun, and I love seeing so much of him, but also a bit odd! It does seem a shame, though, that it was felt Doggett couldn't carry the episode by himself (though I guess he wouldn't have known to consult The Lone Gunmen!). Doggett is an effective character because he is so different from Mulder, and as time would tell, he can carry an episode when he needs to. Doggett and Scully's relationship is one of my favourite things about these late seasons. Mulder and Scully's relationship was supposed to be platonic for a long time, and was the subject of intense debate concerning whether it should stay platonic or not, but wherever you fall on that particular issues, there was always something of a frisson between that wasn't quite a brotherly/sisterly thing. Scully and Doggett's relationship, however, is genuinely, entirely platonic and I love how much he cares about her (despite not having known her all that long) while also respecting her and working with her, and how much she trusts him. So many fans thought The X-Files simply couldn't work without Mulder — but, while it's not the same, it is working. - The third eye effect is OK if a bit plastic-y, but there's some decently unnerving gore and some creepy imagery in this episode. Doggett: This whole story doesn't make a damn bit of sense! Final analysis: All in all, this is a perfectly serviceable late-series Monster-of-the-Week episode, though it can't hold a candle to its much more interesting predecessor! Two out of four third eyes. Thanks, this is a great review. I really like how you pointed out the sad fact that the creators didn't think a Doggett ep would be tolerated by the fans. That's a great observation.